They are ejected thousands of miles from the surface of the Sun. “One of the best known prophecies/predictions of our Mayan elders is the message of a changing paradigm of our era. In the words of the Maya, it is said that we are now in a time of 'change and conflict'. The change is coming from the ‘outside' in the way of weather, natural phenomena, celestial disturbance (sun flares) and manmade self-inflicted trauma. The conflict comes from the ‘inside’ in the way of personal challenge, grief, bewilderment, depression, anxiety, and fear. It is said we are 'at the cross roads'. A time of choosing a new path, deciding on a new self and community direction, venturing into the unknown, finding our true identity of being. 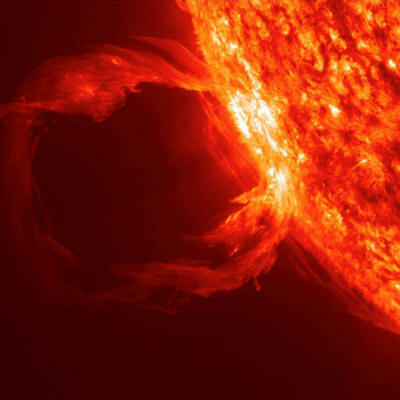 A recent study published in the New Scientist, indicates a direct connection between the Sun’s solar storms and human biological effect. Photonic energy connects to our thoughts so it is important that we know what we want, rather than we don’t want, otherwise, we will manifest more of what we don’t want. Note: The ancient texts, tell us to look to the skies as they would create the catalyst that would bring about change on Earth at this time. Many people are feeling agitated and un-easy recently. We began noticing many new symptoms. We seem to be loosing track of time easily. There were many reports of nausea, and body aches and pains and dizziness. Some feel like they were walking on water (ungrounded). Others said that when they closed their eyes at night, everything is spinning. Are you experiencing any of this? This isn't anything to be afraid of... just be aware of what it is and get extra rest and drink lots of water. A strong geomagnetic storm (Kp=7) is in progress following the impact of a CME during the middle hours of the day on September 9th. This could be the first of several hits from a series of CMEs expected to reach Earth during the weekend. High-latitude sky watchers should be alert for auroras after nightfall. Imagine for a moment all the electrical devices in just your home alone - every light and lamp, the phone systems, all the kitchen appliances. Each device gives off a certain frequency. The television is one of the major contributors of discordant frequencies. Most people a not aware of these frequencies. They have tuned them out; their energy field has adjusted and learned to live with them. These matrixes of electronic frequencies are always affecting the physical body, the mental state of mind. These electronic frequencies are addictive and hypnotizing to your personal energy field. These man made electronic frequencies hold a certain mindset in place. Be aware of these discordant frequencies and the matrix that they create. It is important for you and others to stay anchored, stable, and firm in your own personal energy field and matrix. You will be less affected by discordant frequencies. The solar flares, the galactic bursts of energy are surging through this shield of hypnotizing electronic frequencies, activating certain aspects of the DNA codes. These cosmic energy thrusts are a wake up call to humanity. The earth's magnetic field holds the higher integrity of the hologram in place. This is being overridden by the electronic fields. Humanity is receiving the highest support from the consciousness of the cosmos and celestial beings, individuals are waking up to their magnificence, their divine star connection.